Condo Aries is located alongside the 18th hole of the Jack Nicklaus Signature Bahia Golf Course inside the gates of Punta Mita where the Four Season's world renowned property is located, with excellent restaurants inside the gates. Condo Aries offers unique opportunities to enjoy an incomparable lifestyle. This private residence blends sophisticated, contemporary style in two master bedrooms facing the ocean with en-suite bathroom, it also has an expansive private terrace with plunge pool and a separate living and dining room. 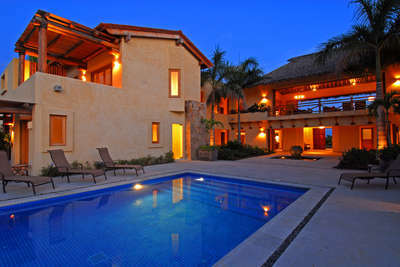 • Premier golf membership that gives full access to all the amenities Punta Mita has to offer. • Booking of tours and excursions. Las Marietas is the newest development within the gates of Punta Mita, it has beautiful private condos located in the same sandy beach as the St. Regis hotel, every condo has three bedrooms, terrace and a private pool with views of the golf course and the ocean. Las Marietas guest's enjoy one of the most privileged locations on all of Punta Mita and enjoy direct access to the beach which guarantees an amazing vacation experience for those privileged to stay here. The property had a great view of the ocean/beach along with the 18th green. It was laid out really well and very spacious for a family of 5.